Today, it has been said, the world is "flat," as online media allow information to move easily from point to point across the earth. International legal differences, however, are increasingly affecting the ease with which data and ideas can be shared across nations. Copyright law, for example, affects the international flow of materials by stipulating who has the right to replicate or to share certain kinds of content. Similarly, perspectives on privacy rights can differ from nation to nation and affect how personal information is shared globally. Moreover, national laws can affect the exchange of ideas by stipulating the language in which information must be presented in different geopolitical regions. Today's technical communicators need to understand how legal factors can affect communication practices if they wish to work effectively in global contexts. <br><br>This collection provides an overview of different legal aspects that technical communicators might encounter when creating materials or sharing information in international environments. 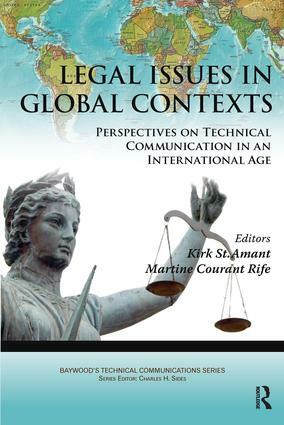 Through addressing topics ranging from privacy rights and information exchange to the legalities of business practices in virtual worlds and perspectives on authorship and ownership, the contributors to this volume examine a variety of communication-based legal issues that can cause problems or miscommunication in international interactions. Reviewing such topics from different perspectives, the authors collectively provide ideas that could serve as a foundation for creating best practices on or for engaging in future research in the area of legal issues in international settings. CHAPTER 1. Hiding Behind a Password: Are Online Classes as Private as We Think?